As the school year approaches, parents across the country are getting ready to send their child off into a new grade. And for parents whose children are going from middle school to high school, they have their hands full! The transition from middle school to high school is a big deal, and let’s look at a few reasons why. It’s no surprise that the classes in high school will be harder than they were in middle school. Middle school is a preparation for high school, and now that your kid has gotten that out of the way, they are ready for their grades to count! Not only will the classes be harder, but their GPA now matters a lot more because in a few short years, they will be looking toward college. In order to prepare for this important change, make sure you help your child develop strong study habits and provide them with a comfortable space to do homework and study. In middle school, your child probably knew almost every child from elementary school. There might have been a few new additions, but it was a logical stepping stone with their friends. 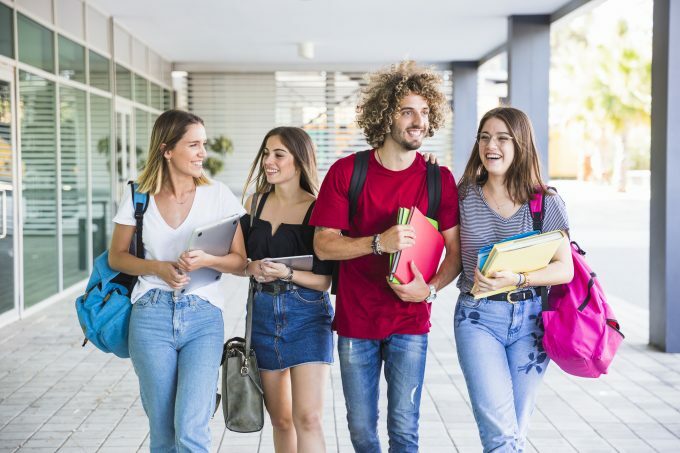 But, high school draws from a number of middle schools, meaning that not only will your child have their existing friends, but they will have many more students around them! This is a great opportunity to make new friends and build up your child’s communication skills. High school is the perfect opportunity for your child to discover their passion outside of school work. Whether it’s a club, a sport, or another extracurricular activity, this is a time for them to build their experience to get ready for college applications. Enjoying extracurriculars during high school is fun, a great time to make lifelong friends, and great for your child’s college application. Undoubtedly, there will be more temptations in high school than there were in middle school. Not only are there more kids and more opportunities to branch out, but there will also be older kids! It’s kind of crazy that young 14-year-olds can be in the same school as grown-up 18-year-olds (don’t panic, mom!). This is natural for your child’s growth because they are learning how to be an adult themselves, but it’s also important to discuss what this means for your child. They may be tempted to branch out sexually, try new things, or taste alcohol. This experimentation is natural, but make sure to prepare your child by explaining the dire consequences of drug or alcohol addiction and abuse. Even though they are young, this can still be a real possibility. If you suspect your child may be using drugs or alcohol unhealthily, check out this clinic finder to find the help your family needs. Graduating from middle school to high school is a big change and an exciting time for both you and your child. By preparing them, this will be an exciting, healthy time of growth.